Chicago Bears Have 3 New Hall of Fame Nominees: What Are Their Odds? Brian Urlacher became the latest Chicago Bears great to don a gold jacket in Canton, Ohio. No team has more Hall of Famers in its history and now it’s time to look ahead to see if any others might be making the cut in the near future. The Hall of Fame committee released its batch of 102 nominees for the 2019 ballot. Leading the class are likely locks including tight end Tony Gonzalez, safety Ed Reed, and cornerback Champ Bailey. Others in the running are receivers Isaac Bruce and Tory Holt, middle linebacker Zach Thomas, running back Tiki Barber, and former head coaches Don Coryell, Bill Cowher, and Jimmy Johnson. Amidst that formidable group are three former Bears, all of whom had memorable careers in Chicago. What fans, of course, will want to know is whether any of them have a chance to get in next year or at all. So let’s go through the names and examine their accomplishments. A seldom-known 3rd round pick from Hawaii during one of the darker periods in Bears history. Nobody had a clue what the team was getting when Olin Kreutz arrived in 1998. It didn’t take long to realize they weren’t just getting a top quality offensive lineman, they were also getting a tone-setter and locker room leader who would set the foundation for one of the more successful periods in franchise history. Kreutz was a six-time Pro Bowl center during his run. He blocked for a number of quality running backs over that span including Rookie of the Year Anthony Thomas, ageless Thomas Jones, and eventual star Matt Forte. 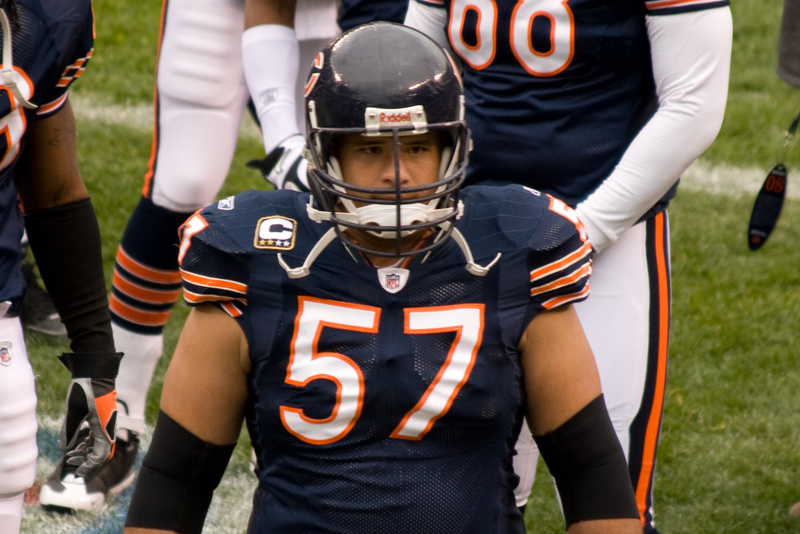 The Bears won four division titles with Kreutz as captain of the offense, including a trip to Super Bowl XLI. He was one of the best centers in football for a long time and is still considered to be the best player ever to come out of the state of Hawaii. What else must a man do for the recognition? He’s got the numbers. He’s got the accolades and most importantly he has the jewelry. He played on arguably the greatest defense in NFL history. It was a complete travesty that the Bears didn’t re-sign him to a new deal in 1988, allowing him to slip away to Washington. He should’ve retired in navy blue and absolutely deserves a spot in Canton. Amazingly enough, there is another former Bear more deserving than Marshall. I’ve actually harped on the fact that Richie Petitbon isn’t in Canton already on a number of occasions. This is another opportunity to do so. This man was one of the best safeties of his era. During his time in Chicago, he recorded 37 interceptions and had 45 for his career. He was an instrumental part of their 1963 NFL championship team, still considered one of the best defenses in history. Then, after he retires, he goes into coaching and has one of the more successful runs as a defensive coordinator ever. From 1981 to 1993, he ran that side of the ball for the Washington Redskins. In that span, his units finished in the top 10 five times and won three Super Bowl championships. Another guy who got it done both as a player and as a coach. It’s so long past time for him to get a jacket.